We need a whole new mind to thrive in the twenty-first century, says Daniel Pink. As theologians we cannot escape the transition from the information age to the conceptual age of the twenty-first century. In the information age the theologian could give answers based on the best information, but in the twenty-first century information is on hand. Empathy and understanding however are in scant supply today. In the information age there was no room for doubt; certainty was the hallmark of a successful information worker. But today uncertainty is a certainty, thanks to globalization, the information revolution and even quantum mechanics. Uncertainty has been grafted into our collective consciousness. It therefore cannot be theological business as usual. It cannot be about giving answers; it is more about finding the best questions to be answered. It cannot be about winning theological arguments; it is more about living in God's regenerative story while we find ourselves in the liminal space of uncertainty. It cannot be about holding strong opinions; it is more about creating space for life, to allow God's generosity to flow through us. 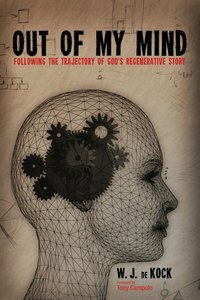 Out of My Mind tells the story of such a transition. "Perhaps our own stories are the most authoritative thing we can say ... precisely because they are our stories. Here, my friend, Wynand, courageously exposes us to his own struggle for spiritual and theological authenticity within the highly ambiguous context of racist South Africa. It's a moving story, but as an artist he also shows how his spiritual narrative can become a mirror to our own souls, and even that of our age. Bravo Wynand." --Alan Hirsch, author of The Forgotten Ways "I am a great admirer of WJ de Kock. His reflections on the dysfunctions of Christian faith in apartheid South Africa are fascinating as a historical study but they also have a powerful message for today's Christians around the world, especially, I think, in the U.S. Wynand calls for a generous and regenerative theology and this book embodies that theology on every page." --Brian D. McLaren, author of Naked Spirituality "In this courageous book, Wynand de Kock utilizes narrative as a tool to share his own remarkable faith journey and to model how narrative can function theologically in the construction and transmission of the faith. This engaging work is a moving example of narrative theology at its best. I am delighted to recommend it to other readers." --John Christopher Thomas, author of The Apocalypse W. J. de Kock (DTh, University of South Africa) is Professor of Practical Theology at Palmer Theological Seminary at Eastern University and the founding director of Openseminary. He has also served as Dean and Principal of theological colleges, was in pastoral ministry, led community organizations, and has contributed to scholarly journals and books. About "Out of My Mind"